To start a new Blog Collage project, you can either create a new project or a sub-project of an existing project. Your project most likely refers to your client or event. For example "Smith Wedding" or "Johnson Portrait." To start a new Collage, first click Add New Project. 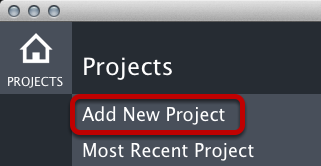 The screen below will appear, allowing you to name that Project. Choose wisely as you can't change your main project name. 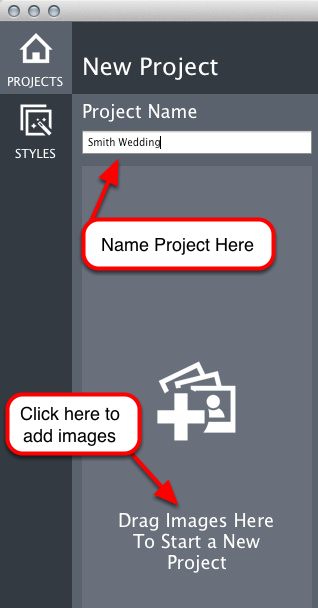 Name your project, then click in the image well to choose a folder of images to import, or you can drag a folder of images into the image well. It makes everything run extremely fast. It makes your projects portable. Once your images are imported into a project, you can disconnect from the external drive or server and keep designing. You only need to reconnect to your full resolution source images when you want to export your project.